The internet has been all a-twitter lately about various forms of expedited aging in whiskey and bourbon. A majority of the discussion has been about whether or not these accelerated products can still meet the legal definitions of Kentucky Bourbon, Straight Bourbon, or even just plain Bourbon (for more on that aspect, check out Fred Minnick’s blog here and here). As that discussion continues, we thought we would give you guys the lowdown on what we know (and don’t know) about some of these processes and how they might work. We’ll be looking at TerrePURE by Terressentia, Cleveland Bourbon, Defiant Whiskey, and the “chemical reactor” from Lost Spirits. Warning, science ahead…and pseudoscience, for that matter, as some of this, though proprietary industry methods, seems a bit shrouded in too much vaguery (read suspect). Abbreviations: GC = Gas chromatography, LC = Liquid chromatography, and MS = Mass spectrometry. Let’s begin with TerrePURE by Terressentia. This process has a significant buzz in the industry and is essentially a way, they claim, to improve a distillate. Ty Tyler began his research in this area in 1999 and has been gaining ground in the awards circuits for his treated products. As of this writing, the company itself is primarily a sourcing and treatment facility for private labels, but has also recently acquired the Charles Medley Distillery in Kentucky and has expressed interest in producing a Kentucky Straight Bourbon Whiskey (more on this later). The main claim made is that the TerrePURE process reduces “unwanted, harsh-tasting congeners” for a “smoother” spirit. They achieve this by utilizing “ultrasonic energy” and “applied oxygenation” following distillation. Congeners such as methanol, isobutanol, amyl alcohols, propanol, methanol and “free radicals” are said to be removed. They have run their product through both GC/MS and LC/MS and, if their graphs here are real, then the process apparently does just that. Whether this distillate is smoother or tastes better is in the tongue of beholder. The interesting thing about these compounds they desire to remove is that, traditionally, they are removed (to variable degrees) by the distiller as part of his selection of the heart of the distillation which involves discarding the heads and tails of the distillate (some distillers re-distill the heads and tails as well). A second claim they make is that as a result of using the TerrePURE process, their products will come with less severe hangovers and they cite research (three papers)* which they claim basically says “the less of these bad congeners, the less severe the hangover.” It’s certainly plausible, at least. Terressentia is up front that this is hypothetical, but there is some research which supports the theory, as they cite. Terressentia also claims that the TerrePURE process “converts harsh-tasting acids to smooth tasting esters.” A 2010 paper from the College of Charleston chemistry department showed their process resulted in the esterification of fatty acids, specifically hexadecanoic and octadecanoic acids, into ethyl esters. If you remember our podcast on the chemistry of bourbon, you’ll know that esters do produce some of the more interesting flavors in bourbon, such as coconut, banana, apple, cinnamon, etc.. These are usually produced from reactions between the barrel and the distillate over time naturally during aging in a warehouse. Some esters have bad flavors as well, such as airplane glue and cleaning products, so the ending result is really a chemistry crap-shoot to some degree. A 2008 study in the Journal of Agriculture and Food Chemistry** does indeed list hexanoic and octanoic methyl esters as present in high concentrations in whiskey, but they do not list at all hexadecanoic and octadecanoic acids or their esters. The slightly more recent 2014 article*** in Food Chemistry by Collins, Zweigenbaum, and Eberle does list oxo-octadecanoic acid as a constituent, but does not call any special attention to it for concentration. Hexadecanoic and octadecanoic acids are much longer chains than hexanoic and decanoic acids, so one would presume these would only come about after much longer aging periods anyway, but that is just our guess. Regardless, go watch a video with the inventor here, and as a bonus you get to see their machine, which looks surprisingly like a Chik-fil-a lemonade dispenser with a giant red “start” button on it. *(1) Verster, J. (2008). The Alcohol Hangover-A Puzzling Phenomenon. Alcohol & Alcoholism, 43(2),124–126. (2) Swift, R. & Davidson, D. (1998). Alcohol Hangover: Mechanisms and Mediators. Alcohol Health & Research World, 54-60. (3) Rohsenow, D., Howland, J., Arnedt, T., Almeida, A., Greece, J., Minsky, S., Kempler, S., & Sales, S. (2010). Alcoholism: Clinical and Experimental Research, 34(3), 509–518. **Poisson and Schieberle. Characterisation of the most odor active… J. Agri. Food Chem. 2008. 56, 5813-19. ***Collins, Zweigenbaum, and Eberle. 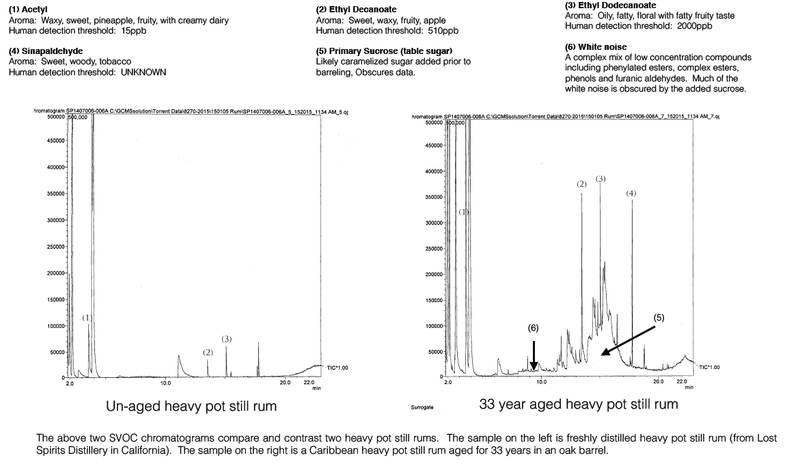 Profiling of nonvolatiles in whiskeys… Food Chemistry. 2014. 163, 186-96. Next up is Cleveland Bourbon Whiskey. From what we could gather, the process is as follows: The whiskey distillate is aged normally in a new charred oak barrel for around 6 months, such that it meets the minimum legal requirements to be called bourbon. At this point, the barrel is chopped up and placed into a proprietary pressure tank along with the now ~6-month-aged bourbon. This tank is then cycled over high and low pressures to force the whiskey in and out of the barrel fragments. There is an additional aspect of “oxygenation,” for which we couldn’t find any details. The company claims that this cycling creates a product that tastes significantly older than its real age of just over 6 months. As for how it tastes, we have not tried it yet, so we can’t say. Our fellow Bourbon media friend Ginny Tonic has, and you can check out her review here. Defiant is a distillery in North Carolina, family owned and operated, which makes vodka and whisk(e)y. They are open about their process to more rapidly “age” their whiskey. They have a large tank into which they dip a great number of spiral cut wooden “staves” (see the picture below). They leave the distillate in the tank for 6 weeks, and what comes out after that time is a whiskey with a nice familiar color, and a taste that I personally guessed at about 4-5 years of age (see our Podcast #6 for my initial complete review, and also check out the Great American Whiskey Fair in Columbia, SC). According to their sales representative that I spoke with while tasting, the average guess is between 4-6 years. Their process is pretty straightforward as explained above, but additional information is that only glass, copper, and stainless steel touches their whiskey (the tank is stainless), and their still is actually from Germany, not Vendome. So how does any of this equate to creating a spirit with a 20 year old signature? According to the “White Paper” provided on the Lost Spirits website, they utilized GC/MS to find each different chemical in the product and how much of it there is. Without getting too technical, these can be really finicky, and they depend on a good database with reliable mass measurements for the compounds of interest. They then compared the 33 year old rum to a new rum distillate to see how certain compounds and their levels changed. This was used as a set of standards with which to compare their Colonial Rum made with their proprietary chemical reactor. Are you all scienced out? Well, go get a bourbon, this is going to get worse. (E)-beta-Damascenone (cooked apple, fruity), gamma-nonalactone (coconut), gamma-decalactone (peach), (3S,4S)-cis-whiskey-lactone (coconut), eugenol (clove, spice), vanillin (vanilla). We want to give them the benefit of the doubt, but this is the source they give in their paper for the above compounds: http://www.leffingwell.com/esters.htm. Please, do take a moment and visit that website. You’ll be greeted by a copyright 1999 webpage that plays “Surfin’ USA” through your speakers. So could these compounds be representative of aging? Possibly–but also possibly not. As we know, every barrel and every piece of wood is different, so we would expect compounds to vary widely among them. The provided evidence is based on a single sample, and that’s just not good enough for us. We’d love for one of these processes to work, but so far, the science just hasn’t convinced us. We hope to get the chance to taste some of these products in the near future and put them to the human test, but, until then, all we have is the data. We have contacted Lost Spirits regarding why they chose these particular compounds, and will provide an update if they get back to us. So what now? Why go through two years of general chemistry and organic chemistry on our blog? The Bourbon Question, that’s why. As stated at the get go, the big buzz around all of these new “fast aging” methods is making people ask, “Will it be bourbon? Will it be Kentucky Straight Bourbon Whiskey?” Good questions with, what we think, are mostly straightforward answers. Federal Law defines what is and isn’t bourbon, and Kentucky law states what has to happen to put “Kentucky” on the label as well. See our PODCAST #1 and 27 CFR 5.22 and KRS 244.370 for all the juicy legal details and history. Again, the reactions that occur naturally during the aging process inside a barrel make most of the contribution to flavor and aroma, and 100% of the color of an aged product. To oversimplify a little bit, over time, many compounds undergo reactions, aided by oxygen, adding to their size, or chain length, and, for the most part, resulting in tastier compounds. Aging is, of course, different for every barrel and every rickhouse condition, so when a whiskey hits its ‘sweet spot’ can vary drastically. With regard to TerrePURE, one asks, “but wait, this process seems to be performed on raw distillate, how does this give me any simulated barrel age?” It’s a very good question with again a very mysterious answer. They state that they are “infusing charred oak staves” during the processing for whiskeys. What that means is anyone’s guess, and we couldn’t find any further information about it. Presumably this means that barrel fragments or such are placed in their system and jiggled about by ultrasonic waves (think jewelry cleaner machines at the mall) and infused with oxygen to simulate aging. So would this itself be bourbon? We say no, as it hasn’t been aged in new charred oak barrels. Fragments of wood do not a barrel make. Additionally, at what point does removing these compounds in a distillate take it too far away from the character of the grains specified in the definition of whiskey itself? That’s a very important question with probably a not very straightforward answer. Now, to be fair, in one of the articles above at Fred Minnick’s blog, the Terressentia CEO, Earl Hewlette, states when they do begin making bourbon, they will comply with all laws regarding aging (i.e., at least one full year in Kentucky to have “Kentucky” on the label, and a at least two years for it to be labeled “Straight”). Thank you, Fred, for being on the ball with this, and thank you, Terressentia, for being open and responsive! 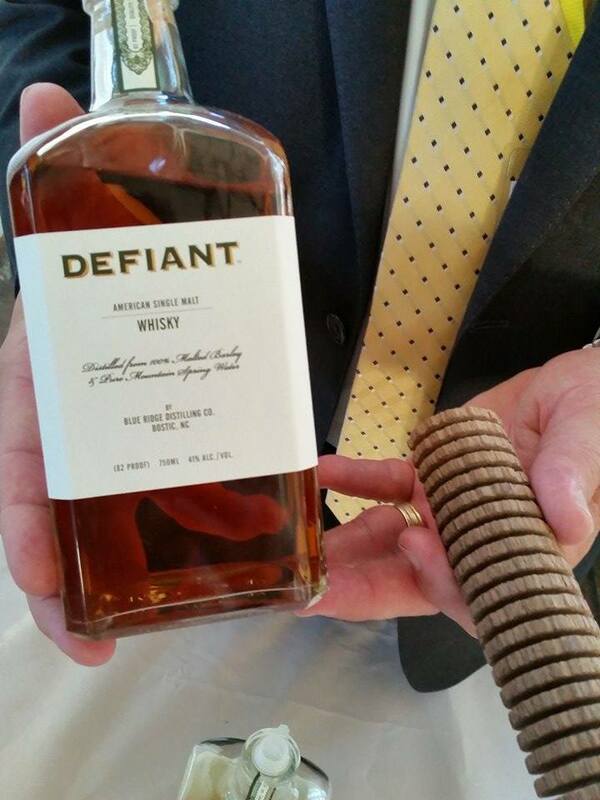 Defiant is calling it plain “whisky,” so they are off the hook. Is it whiskey, yes. Is it decent, yes. OK, fine. Cleveland Bourbon apparently had their heart set on calling it bourbon from the start. They appear to be following the laws and are openly stating as such. Is it bourbon? It appears so. Is it good? Again, we haven’t tried it, but let us know what you think. As far as the Lost Spirits process goes, without knowing what they are adding, and possibly subtracting, to make their ‘chemical reactor’ function, it is impossible to say how this would affect calling their products “bourbon.” At this point, it is unclear, but on possibility is that the law is possibly behind the technology and would allow for it to be called as such. So that is our best answer so far to the Bourbon Question. However, there is another level to this. A slightly nefarious level. What will the labelling be like? The article above from Fred Minnick covered this, and we agree with Fred, perhaps not to ascot-donning levels, but agreement nonetheless. At the Bourbon Classic Master’s General Session, he asked the panel about labeling and honesty and up-frontness in that regard. We were treated to what became a somewhat tense and heated exchange as views differed greatly on the panel. We at BOTB would like to come out publicly as being very much in favor of honest and up-front labelling. Aged 6 weeks? Then put “Aged 6 Weeks” on the bottle and explain briefly the non-barrel aging process used to do so on the back label for instance. In short, don’t be deceptive or obfuscate. Cleveland Bourbon appears to be upfront which we applaud them for. Defiant is likewise upfront and open about their entire process, so that’s always excellent. Lost Spirits appears to be experimenting with whiskey and bourbon, as they are primarily in the white spirits business currently, so time will tell. TerrePURE hasn’t released a bourbon yet, but state they will follow all laws accordingly. We hope this has been helpful to your understanding of these new processes. It’s almost inevitable that more of these will be popping up in the near future, so don’t expect this topic to go away from bourbon circles any time soon. Hopefully this little article will also help you sort through some of the claims, present and future, so you can sort them out for yourself to make the best decisions when you go spend your hard earned money on a bottle of whiskey–bourbon or otherwise! A final note is this: We are not at all against these new technologies and methods. We are science nerds ourselves and love this kind of stuff. We also are both bluff old traditionalists who don’t like change, and it’ll take a lot to convince us with regard to these new “aging” technologies. One thing we try and do consistently is have it be abundantly clear when we are stating facts as best we know them to be, and when we are stating our opinion. Hopefully we’ve stayed true to that in this complex article. Let us know what you think! Cheers from Chris and Darren! I feel like you guys have a huge bias against new technology. If humans can land on the moon, why can’t they replicate a product like bourbon in shorter time? People make synthetic diamonds after all. Don’t knock this stuff until you’ve tried it. Hi, Phil! Thanks for reading and commenting. We have only tried one of the whiskeys addressed in this article. The ones we haven’t we stated as such. Believe me, we’d love to try the others and give our thoughts on the taste like we did for Defiant Whisky. Like the last paragraph says, we don’t like change…they’ll have to work hard to make a product using these methods that’s as good as a good mid-ground bourbon. One day that might happen, heck, it’s almost inevitable. We’re skeptical of these four processes at this point for the reasons described in the article. We haven’t knocked any of their products because we haven’t tried them all. However, we have rightly questioned their processes’ efficacy because we have looked at their research and methods, at least as much as they publicly will tell, and have concluded they raise our eyebrows…at least one skeptical eyebrow! This was a fascinating article, and thought-provoking. I definitely prefer your version of skepticism over other kinds I’ve seen that are founded as much (or more) on insinuation as the publicity for these companies is. I completely agree that honest labeling is important. What I wonder about — and the complicating factor that your conclusion bypasses — is what exactly the labeling indicates. According to the “letter of the law,” the labeling simply communicates the amount of time the liquor spent in a barrel (or tub or vat or whatever). But we all know that “15 years” and “4 years” have very different connotations about flavor and quality. And what these companies claim is that these connotations are unfair to their products, since they produce comparable flavor and quality. To me, we have only two possible conclusions. Either we defer judgment to some (indeterminate) external authority that will decide whether these new spirits are comparable to aged spirits, or we assume the producers are acting on good faith (that they have tested, tasted, experimented, doodled and riffed, and they firmly believe with some degree of empirical authority that they’ve produced something comparable to aged spirits). In both cases, we need a new standard: either a new standard of authority, or a new standard of honesty that does not resort to the traditional age statement. I wonder if anyone would adopt a standard statement like: “Processed to Simulate X Years Aging” or something. As it stands, small distilleries assume their customers already know what’s up — I’d be more worried about the big guys like Terressentia or whoever provides Templeton with its flavor packets. Michael, thanks for the excellent response, and actually reading the piece! I think only time will tell how popular these types of processes become, and whether or not the TTB will be forced to deal with them. I feel like an absolute age statement should be required regardless, but your point about adding a “processed to simulate X years” would be a viable marketing statement. The bigger question remains, which processes should they be required to tell us about? We all hope they’d do it voluntarily, but of course that would never happen. If we ever happen to run into each other, we should definitely continue this discussion. We’re buying the first round! No place in the TTB rules and regulations does it say barrel. All it says is Oak container. Is your gas container made of gas? Age is irrelevant when it comes to Whiskey. It is the maturation and the marriage of white whisky and oak. Put crap in a barrel and 10 years later you get crap out. Barrels are 1,000+ year old technology that was never designed to age whiskey. Unless you guys are making whiskey yourselves you are just repeating what the major 4 companies have been telling you for years. The laws in place were never intended to protect the consumer. They were put in place to protect the whisky barrens that had the law made in their favor. The wine and beer communities embrace technology and change. The whisky communities are all about secrets and “tradition”. There should never be a secret process or secret room in a distillery. There should be 4 ingredients. Water, grain, yeast and oak. Wake up sheepeople and quit believing what these mega corporations are telling you and think for yourself. Where does Cleveland Whiskey read that bourbon distillate has to be in a new charred oak barrel for 6 months, couldn’t they do it for a few hours and still call it bourbon? All it has to be is “aged”, any period of time is considered aged. Also, you say that you would love to have a 10 year old buffalo trace distillate that only takes 6 months to age, but really what you mean is that you would love a bourbon that tastes like it’s 10 years old but is cheap. When you look at the cost of these fake aged liquors, they’re stupidly expensive. Cleveland Whiskey is $40, Lost Spirit Rum is $100! What is the point of these gimmicks if it doesn’t make good liquor cheaper and more accessible? Both good points. You’re right that it could basically just pass through a charred, new oak barrel and meet the definition still. And as far as pricing, you can easily get actual 10 year old products for much cheaper. So yea, a cheaper AND older tasting product would be our preference. Thanks for reading! We’re you at the great American whiskey fair in columbia? If you didn’t get to try some bourbon aged on cherry/peach/pear/apple wood there, I’ll be up in the Lexington ky area soon. Hi, Chris! I (Darren) sure was at the GAWF in Columbia last month. It was a great fair, even better than last year. I didn’t try any of what you mentioned, unfortunately. Was trying to stick to the more traditional bourbons (tried not to get too many sheets to the wind!). this sounds pretty interesting. I have searched for more information, also scientifically proven one and I found that Hielscher sonicators (https://www.hielscher.com/sonication-of-wine-innovative-applications-of-ultrasound-in-wineries.htm) seems to be quite frequently used in research articles. Do you know what kind of sonicators are used by the distillers? I hope to read more about this soon!